Sometimes you will hear about the stabbing method or the sewing method when working embroidery stitches. Many of the stitch tutorials on The Spruce show or describe these different methods for the same stitch. Which might leave you wondering what's the difference and is one better than the other? Some embroidery stitches only work using one method or the other. For example, a french knot is essentially worked with the stabbing method. That's what you learn, and that's all that will work. However, you can work many embroidery stitches with either method. The benefit to this is that you can find a stitching style that works for you and for the embroidery you're working on. When using the stabbing method, you start by bringing the needle up through the fabric. Next, you take the needle back down through the fabric. And back up, and so on. With each stitch, or each part of a stitch, the needle passes through the fabric. As you're working this way, your hands are constantly going back and forth between the front and back of the fabric. Working with the stabbing method can give you a higher level of stitching accuracy. You can stab the needle through the fabric exactly where you want it to go. This can be especially helpful when keeping the length of stitches consistent. One downside is that the stabbing method is often a little slower than the sewing method. Moving your dominant hand and pulling the needle and thread all the way through at each step adds time to your stitching. When working with the sewing method, you also start by bringing the needle up through the fabric. But from then on, the needle remains on the surface of the fabric, dipping down and coming back up in a single stitch or part of a stitch. This method would be similar to hand quilting or sewing with tiny running stitches, in which you would load several stitches onto the needle at one time. Dipping the thread down and up is easier if you are working without an embroidery hoop or if the fabric has a bit of give, rather than being tightly hooped. 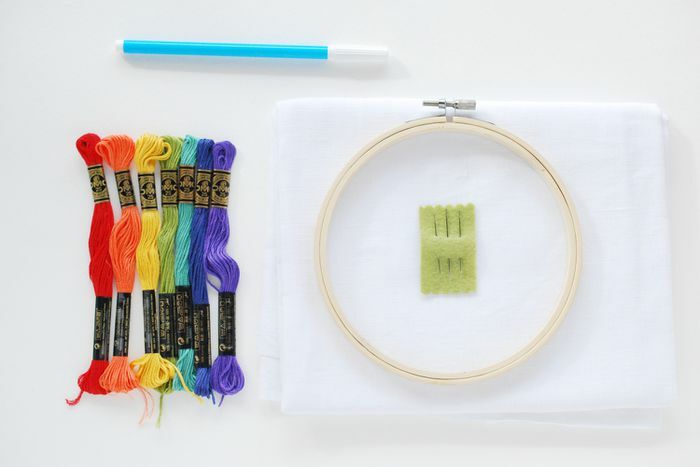 Because you are keeping your dominant hand at the front of your embroidery, as well as working two steps of a stitch at once, this method can make your stitching faster. If you form a rhythm as you work, it will be faster still. Sometimes, however, it's hard to visualize where the exit point should be for a stitch when using this method, which means you may need to pick out stitches and redo them. Which of these methods should you use? And should you choose a favorite and always use that method? Neither of these options is better than the other because ultimately it's a matter of taste and what feels the most comfortable for you. 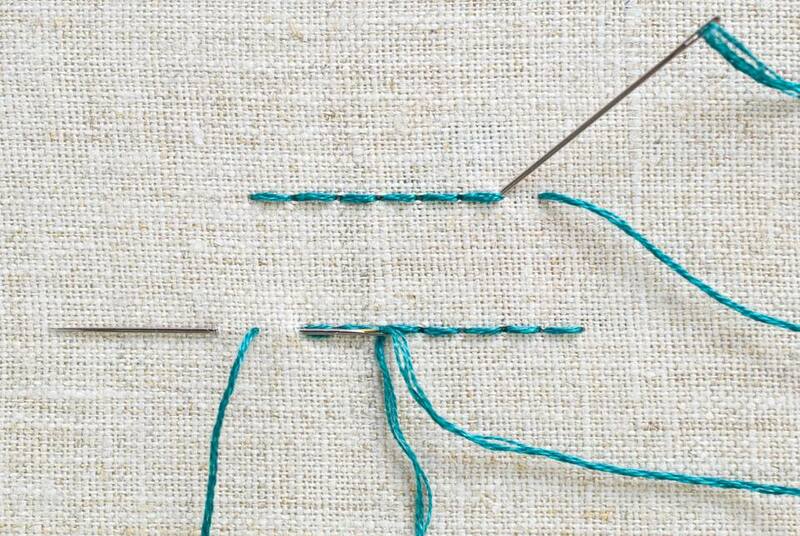 When you're learning a new stitch, try both stabbing and sewing. Do the same if you're having trouble with a stitch, or are looking to increase either your accuracy or speed. As you try the two methods with different stitches, you may find that you enjoy working some with stabbing and others with sewing. You may also find that with one method, it's easier to work right to left, while the other is better working left to right. There are no rules here, so experiment and go with what works!